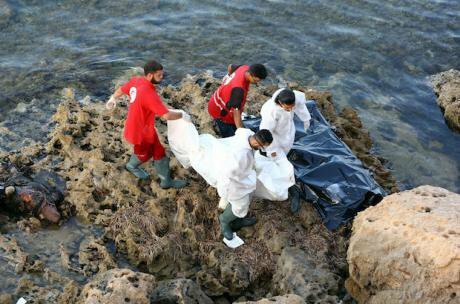 Members of Libya's Red Crescent carry bodies of drowned migrants trying to reach Europe, in Tajura, a coastal suburb of Tripoli, capital of Libya, on June 27, 2017. Picture by Hamza Turkia/Xinhua News Agency/PA Images. All rights reserved. The key political question in recent months has been how to reduce the number of unauthorized migrants that arrive to Europe’s shores in rickety vessels from politically unstable countries in North Africa. The overwhelming majority of the more than 134.000 migrants that arrived by sea to Europe this year landed on Italian shores (approximately 103.300). Most of the migrants landing in Italy departed from wartorn Libya. Italy seems to have found a solution for reducing these numbers. According to figures released by the Italian Ministry of Interior, the numbers of migrants dropped from 23.524 (June 2017) to 5.600 (August 2017). Last year, Italy counted more than 25.000 arrivals per month and in August 2015 more than 130.000. This decrease in numbers is largely based on a Memorandum of Understanding, an informal political agreement, between Italy and Libya that aims to “combat illegal immigration” and “reinforcing the border security” between the two countries. Although the agreement was already concluded in February 2017, it seems that technical and financial support, as well as training of Libyan security personnel became effective only a few months after its conclusion. Marco Minniti, Italy’s minister of interior, described the decreasing number of arriving migrants as a political success and wants Europe to pay its share. Indeed, the EU did pay its (limited) share. In February this year, EU member states enhanced the Malta Declaration that envisages “training, equipment and support to the Libyan national coast guard and other relevant agencies” and in April 90 million euros were earmarked for Libya in the EU Trust Fund for Africa. Of course, the decrease in numbers does not mean that the people stopped fleeing persecution, violence, or poverty, but simply that they stopped arriving to Italian shores. This raises the question: where are they? The answer on the whereabouts of unauthorized migrants presupposes knowing whom the Italian government exactly finances. It seems paradoxical that despite widespread media coverage, there is hardly any knowledge about which groups and factions are in fact financially supported. The Memorandum of Understanding, concluded between the National Reconciliation Government (NRG) in Libya and the Italian government, suggests that funds flow to the NRG. Yet, as control of Libyan territory is fractured between local armed militias, ‘city-states’, two rival governments, and Islamic fundamentalists, limiting the dispersion of funds to the NRG would not produce the effects of significantly reducing departures from Libya. Thus, the Italian ministry of interior broadened its strategy to include the local level, including mayors of several Libyan cities. Moreover, credible reports exist about financial flows to groups in other parts of Libya, including to tribes that control Libya’s southern border. The informal agreement concluded between Italy and Libya was not the first of its kind. Already in 2008 the governments of the two countries, back then Silvio Berlusconi and Muammar Gaddafi, concluded a Treaty on Friendship, Partnership and Cooperation that set forth efforts to prevent irregular migration. On the basis of that treaty, Italy intercepted migrants on the high sea and returned them to Libya. In the landmark Hirsi judgment, the European Court of Human Rights held that the interception and forced return of migrants to Libya violates the prohibition of non-refoulement and collective expulsion. So, is the current strategy of containment merely old wine in new bottles? Instead of channeling funds to one dictator, isn’t Italy merely funding two-dozen warlords now? The fact is: we do not know (and possibly also the Italian government does not). The lack of knowledge could be described as a side effect of the way developed states globally govern (undesired) migration. Informal agreements largely replaced formal treaties. Cooperation between two governments has been supplanted by networks that consist of private companies, government officials of different ministries, NGOs, and paramilitaries. All of these actors pursue their own often conflicting interests. Struggles over these interests result in constant fluctuations of the actors and their importance. Particular financial interests might result in violent conflicts between different militia fractions that are part of the network, as the fighting in Sabrata demonstrates. And particular actors, such as General Haftar, might use the network to transform his image from warlord into a serious politician. No specific actor really is in charge: the network is. This purposefully built complexity renders it extremely difficult to actually gain knowledge about the processes and acts of the network. An aura of secrecy prevails, as anyone passing the security check at the European Border Agency will confirm. This highlights another point: diffusion of responsibilities and clear structures are not merely a side effect, but a legal strategy. The Australian government, for instance, introduced penal sanctions (imprisonment of up to two years) for personnel that leak any information on the offshore regional processing centers in Nauru. German legal theorist Carl Schmitt argued that the colonization of vast new spaces by European states constrained warfare between European powers. These spaces were literally beyond the international legal order where violence was unconstrained. Unconstrained violence used in these spaces provided stability to the European legal order. Although we might not have any knowledge about what exactly happens, how responsibilities are allocated and who exactly is part of the network governing migration, the ubiquity of media and civil society reports renders it difficult to deny awareness of the violence perpetrated against migrants in Libya. Italian journalist Lorenzo Cremonesi reported about foxholes where migrants were kept over months. Sexual and severe physical violence are ubiquitous and forced labor widespread. Migrants are regularly detained indefinitely in overcrowded cells. Even in state run official refugee reception centers sanitary conditions and hygiene are bleak, as a confidential EU report issued last August described. Violence serves as deterrence. The battered and raped bodies that return to the countries they fled function as signposts warning other prospective migrants. It is hard not to see the parallel between the states that contain migrants on Europe’s behalf and Carl Schmitt’s theory. They – states with factually inexistent legal protection mechanisms – constitute spaces of unconstrained violence and at the same time constrain tensions and conflicts within the European legal order that would otherwise arise on distribution of refugees and allocation of responsibility for examining asylum claims. Violence serves as deterrence. The battered and raped bodies that return to the countries they fled function as signposts warning other prospective migrants. These spaces of unconstrained violence often are literally beyond the pale of law. De facto inexistent legal protections in Libya render claiming one’s rights illusory. Holding Italy responsible for violating its obligations under human rights law depends on the existence of an actual relation between the sovereign and an individual. Italian state agents must exercise some form of actual control over an individual. As the Memorandum of Understanding sets forth, Libya exercises control when intercepting migrants and in the detention centers. Establishing legal responsibility under the rules on state responsibility seems equally difficult. It requires knowledge of the facts. Although in principle Italy could be held responsible for providing aid or assistance to Libyan agents who commit human rights violations (derived responsibility). Proving such responsibility requires a high evidentiary threshold: Italy must have provided aid or assistance not merely with knowledge of these human rights violations, but also with the intent that these violations are committed. This threshold might in some lone instances be met, but more often than not the strategy of knowledge diffusion will be successful. In a sense, Italy has learned its lessons from the European Court of Human Rights Hirsi judgment: it learned how to avoid the costs of non-compliance with human rights and the judgment might even have served as a blueprint to do so. In a world of networks, the latter are always one step ahead of the judiciary. Italy’s current containment policy in Libya is, literally, buying time. It stands for a broader European containment policy, a policy that does not work. Even the most cynical argument – deterrence by violence – is an assumption that does not work. Abstract suffering in the future that individual imagination always hopes to avoid, stands against concrete experienced suffering in the present. Like human behavior adapts to changing policies of containment by changing routes, hope is an infinite reservoir of the human mind. These violent acts are policies with the aim to deter migrants. At the same time, they are also responses to the attempted border crossing of migrants, of concrete persons. These responses Europe gives shift its normative fault lines and thus constitute the normative core of its self-representation – a Europe united in the containment of the Other.